In the good old days, magic was powerful, unregulated by government, and even the largest spell could be woven without filling in magic release form B1-7g. Then the magic started fading away. Fifteen-year-old Jennifer Strange runs Kazam, an employment agency for soothsayers and sorcerers. But work is drying up. Drain cleaner is cheaper than a spell, and even magic carpets are reduced to pizza delivery. 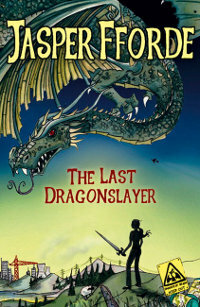 I’m over at the FutureBook blog today, reviewing the enhanced ebook of The Last Dragonslayer, which is Jasper Fforde’s latest book and also his first YA novel. I’ve read and loved Jasper Fforde’s Thursday Next series of literary detective books, which start with The Eyre Affair, together with his Nursery Crimes series and his most recent novel, Shades of Grey. If you’ve yet to take a trip into his world, I can’t recommend the books highly enough. They’re written for avid readers and peopled with figures from literature like Rochester, Miss Havisham and Hamlet, full of clever literary references and in-jokes, zany humour and a great cast of characters of Fforde’s own making. They’re smart and witty but, above all, fun books to read. I was keen to read The Last Dragonslayer because I wanted to see what kind of world Jasper Fforde would create that included dragons. (Hey, I’m Welsh. I like dragons.) He doesn’t disappoint in conjuring up one which is very much his own, slightly off-kilter to ours but not wholly foreign. It was also the first time that I’ve read a book on my iPod Touch and I thoroughly enjoyed it. I always believed reading on a small screen wouldn’t be much fun but I’ve been proved wrong. It was also interesting to see what additional features an ebook included. I haven’t read any Jasper Fforde (only Katie) but you sound so enthusiastic I think it’s one for the tbr pile. Thanks! You won’t regret it, Chris. He is absolutely brilliant. Look forward to hearing what you think. I’m with Chris – I’ve not read any of Fforde’s books but this one sounds fantastic! Great review, Kath, and congrats on being on FutureBook! I’ve only read one of his books, but did enjoy it and this sounds great. Maybe I should buy a copy for one of the teens to read. Thanks. Prompted partly by this I wrote something today on Dragons at Corner Cupboard – in particular the dragon remains found at Llancofi in Carmarthenshire in 1882, from where we learned for the first time how dragons breathed fire. Rather sad that the dragon slayers got the upperhand and wiped out these noble vegetarian creatures – but they did do a terrible amount of damage. Sorry it’s taken me so long but I’m heading over to the Corner Cupboard to have a read now, Fennie. Give the squirrels your email address & they'll let you know whenever there's a new post.